A decade ago, Vanessa Dingivan was a baker and a pastry chef. Then the recession hit. Unemployed and looking for work, Vanessa turned to the Boys & Girls Clubs after a recommendation from her niece and nephew. Originally, she thought her position would be temporary, but quickly realized this role gave her a sense of purpose along with financial stability. This is Vanessa‘s story. Vanessa has now been the Nutritional Service Coordinator at our Wattles Club for 8 years. She has stayed with us for so long because of the sense of fulfillment she gets from serving our youth. 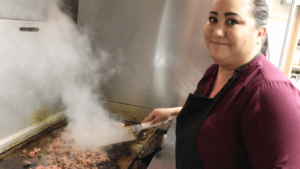 She is inspired every day by the Wattles Club community, and her love for the members and families shows in the time, planning, attention, and care she puts into each meal served. Much of Vanessa’s connection to the Club stems from her heritage and the memories of her mother’s cooking. Growing up, she remembers rushing home, bursting through the door, and being greeted with warmth from her kitchen and the scent of delicious food being prepared. That smell gave her a feeling of safety, which she now passes on to Club members through her work in the Kids Café. When she lost her mother last year, Vanessa found solace in her work and the deep connection she feels to the youth and Club community. Seeing youth enjoy hot, nutritious meals with their friends brings her a sense of pride and fulfillment. Not only that, daily meals help foster a sense of belonging among the kids and staff, and ensures that youth have energy to focus on Club programs and activities, rather than on hungry bellies. With her background as an experienced chef, Vanessa loves to introduce new, nutritious dishes to members. She is adamant that when she cooks for members, she won’t serve anything that she wouldn’t want to eat herself. By helping local youth achieve healthy lifestyles, Vanessa helps make it possible for local kids to achieve their Great Futures. Thank you, Vanessa, for your eight years of tireless dedication to excellence at Boys & Girls Clubs of Portland Metro! The Boys & Girls Clubs of Portland Metro is an equal opportunity provider.